It’s that time of year again – the excitement of Halloween is in the air and everyone is working on their costumes and planning parties. And what’s Halloween without our favorite sweet treat, candy? In the spirit of the holiday, we wanted to pay tribute to Dylan’s Candy Bar, one of the most well-known candy stores in America. Founded by Dylan Lauren – who happens to be the daughter of designer Ralph Lauren – Dylan’s Candy Bar plays host to just about every type of candy imaginable. Living up to the family name, Dylan’s Candy Bar is not only sweet but stylish, too, making it a perfect source of fashion inspiration. Below, I’ve created a series of sweet outfits inspired by Dylan’s Candy Bar. Scroll down to see the looks! For a look perfect for those with a bit of a sweet tooth, try a brightly colored blouse over colorful skinnies. Dylan’s Candy Bar rainboots make the perfect pop of color for days where the weather is a bit gloomy. 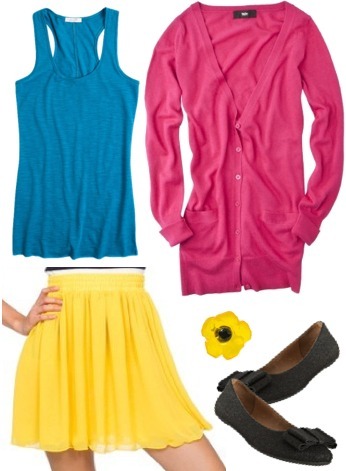 Add candy button earrings to finish off this cute outfit! When candy just isn’t enough, put on this vibrant knit dress to help satisfy your fashion cravings. Add a colorful pair of pumps and bright socks to continue the color-blocking affair. A circle scarf is a great addition for colder days, and the lollipop stud earrings complete the sweet ensemble! A more subtle take on the super-sweet look can be made with a simple tank tucked into a chiffon skirt. Contrast the simplicity of the pieces with vivid hues inspired by Dylan’s signature colors. Add a pretty cardigan and bow flats for a feminine flair. To tie it all off, add a cute candy statement ring to match. For a look that’s more relaxed, grab a Dylan’s Candy Bar tank and layer it under an oversize tee. Colored denim high-waisted shorts and oxfords add to the casual look. 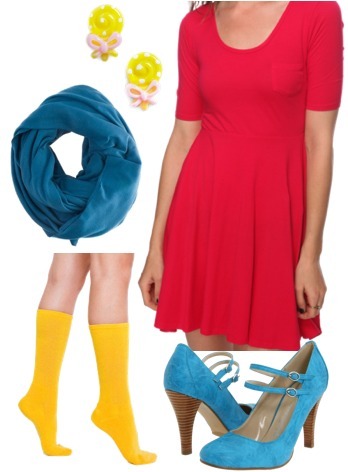 Finish the outfit by adding a cute ribbon headband and colorful stud earrings. Do you shop at Dylan’s Candy Bar? Would you use it as a source for fashion inspiration? Would you wear any of the looks above? Which one is your favorite? Would you like to see more posts like this in the future? Let me know in the comments!